There’s something very liberating about packing up your bags, hopping on your bike, and going on a long ride across the country. People who have experienced such trips often come back with a lifetime’s worth of great memories, pictures and incredible experiences. Many movies have attempted to capture this spirit and translate it onto the big screen. Here are some of the best ones. 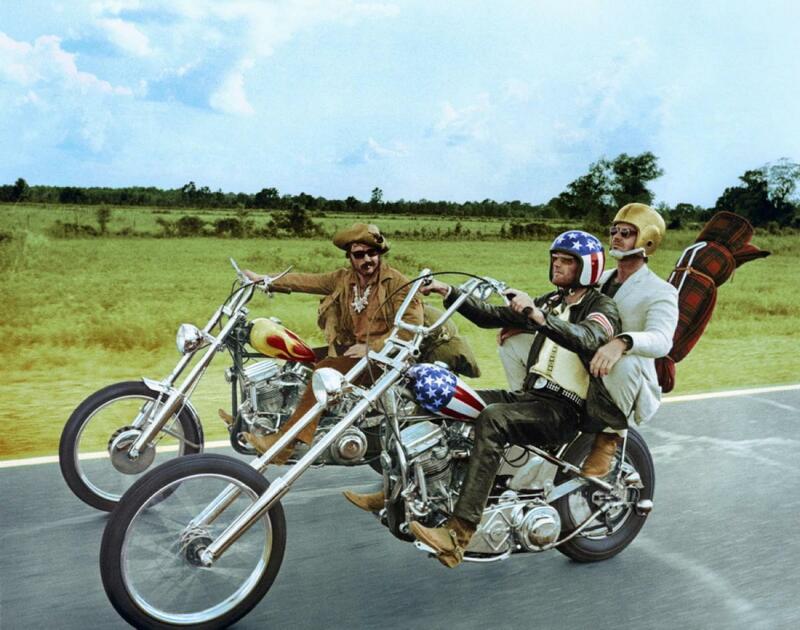 Easy Rider is one of the most well-known road movies, the film won several accolades when it was first released in 1969. It was directed, produced and written by Dennis Hopper, Peter Fonda, and Terry Southern. Fonda and Hopper also play the lead actors and bikers who earn a fortune off of selling cocaine and decide to tour the American South and Southwest. This is an in-depth exploration of the prevailing counterculture in the 1960s and looks at the drug scene, the hippie movement, and the communal lifestyle. This film is on the US National Film Registry and is considered culturally significant. On Any Sunday is a documentary film that was released in 1971. It describes the motorcycle lifestyle, industry and showcases racers as well as enthusiasts. Several prominent racers and performers like Steve McQueen, Malcolm Smith, and Mert Lawwill are featured in this movie. The documentary also does an excellent job of showcasing the different bikes used back in the day and includes vehicles from manufacturers that no longer make them like Bultaco, BSA, and Hodaka. The documentary is a great introduction to the landscape of a professional motorcycle circuit. Hells Angels On Wheels is in every bikers movies to watch list but it doesn’t really have the same status as On Any Sunday. This is a fun movie to watch when you just want to have a great time and don’t care much for the back story. It was released in 1967 and stars Jack Nicholson, Adam Roarke, and Sabrina Scharf. The story is about a gas station attendant who gets a chance to hang out with an outlaw motorcycle club, the Hells Angels. The movie showcases what life with Hells Angels is all about although it doesn’t talk about the actual organization that deeply. Born Losers is another iconic movie that taps into the motorcycle culture, especially the outlaw clubs and their criminal activities. It was released in 1968 and was well-received by the public, though not by the critics. It highlights the discrimination Native Americans faced during that time and the primary protagonist is a half-Indian Green Beret veteran who fought in Vietnam. The movie shows his struggle against the biker gangs and the discrimination he faced by police and authorities when he sought help. This is the first movie in the acclaimed Billy Jack series. Choppertown is a relatively recent movie in comparison to other mentions on the list because it was released in 2005. It’s highly rated by bike builders and critics alike and is considered one of the classic motorcycle movies. The documentary was directed by Zack Coffman and Scott Di Lalla with Jason Jessee, Kutty Noteboom, James Intveld, Cole Foster, and Rico Fodrey as the case. This movie showcases Kutty’s process of building a custom working man’s chopper from scratch with the help of two friends. It also gives you a glimpse of the famous motorcycle club, the Sinners. The Wild One is perhaps the most iconic movie on this list and is considered by most the OG outlaw biker movie. It was released way back in 1953 and stars the legendary Marlon Brando. It’s the first movie to explore the American motorcycle outlaw gangs and the violence related to them. At the time of its release, the movie was a hit and well-received by the fans. Time has only improved its appeal because it’s a raw and brutal look at the criminal elements connected to the motorcycle gang. All of the acting performances are top-notch as well. The movie has some of the most iconic dialogue as well and the “Hey, Johnny, what are you rebelling against?” and “What’ve you got?” exchange between Johnny and Mildred is listed in American Film Institute’s 100 Years – 100 Movie Quotes list. This film didn’t attain much success in the box office and was a huge financial failure when it was first released in 1991. Mickey Rourke and Don Johnson starred in it and the movie was directed by Simon Wincer. Despite the initial response, the movie has gone on to become one of the most iconic biker movies in the industry and is considered a cult classic. It showcases the typical male-biker stereotype. The movie is considered so ludicrous that it’s hilarious, which is why so many bikers and movie lovers watch it. If you want mindless entertainment from your biker movies, this should be on your list. Why We Ride is a documentary as well and was released in 2013 to much critical acclaim. The movie was directed by Bryan H. Carroll and is considered a celebration of the motorcycling community. This documentary sheds a very positive light on a community that’s often viewed with suspicion and highlights the bond between riders and people who ride together. The direction is superb and very crisp, which is one of the best aspects of the movie. It explores the joy and freedom that bikers experience and uses advanced photography techniques and equipment to translate the feeling onto the screen. This is a must-watch for any motorcycle enthusiast. A motorcycle movie created by Quentin Tarantino in collaboration with Larry Bishop has to be mentioned on this list. If you’re familiar with Tarantino’s unique style of moviemaking, you’ll know what to expect. It’s a revenge-movie where a biker gang seeks retribution when one of their own gets killed. It draws inspiration from several classic 60s and 70s motorcycle gang movies so it doesn’t have the polished vibe of modern movies. It’s just as raw as you would expect a Tarantino movie to be. This is a movie that you must watch if you’re interested in bikes and the motorcycle community. The movie was released in 2005 and stars Anthony Hopkins. This alone should let you know that you’re in for a real treat. This movie is very uplifting and is based on a true story so anyone who loves motorcycles will connect with it. The story surrounds Burt Munro who spent 20 years rebuilding a 1920 Indian and set the land-speed record with it. These movies are definitely worth a watch if you love motorcycles and taking long trips. But even if you aren’t attracted to the motorcycle culture, you’ll appreciate these story-lines and enjoy these movies.